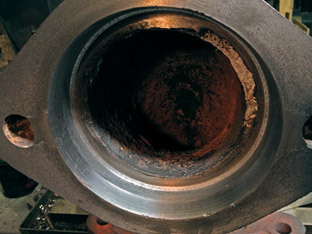 The regulator 'J' pipe is located underneath the boiler dome and takes full pressure steam up to the bottom of the regulator housing. 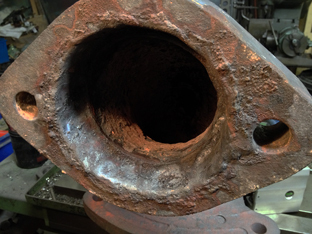 The steam has eroded the coupling seats and a very obvious crack has been found between the steam outlet and the bolt holes - the crack has been welded (cast iron) and the seat built up to be machined. The whole component has been in the oven for many hours to ensure that the weld remains in a soft, machinable state. 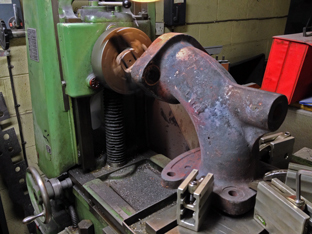 We mount the casting on parallels onto our horizontal boring machine, clock where we can the original faces and centralise between the original mounting holes to ensure that we correctly define a datum for machining. 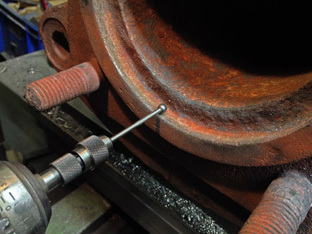 Our machine is fitted with a 'facing head' so that we are able to feed out the boring bar whilst the chuck rotates which allows us to both bore and face without stopping for tool adjustments. The part is shimmed slightly so that we machine the minimum amount possible from the face to achive a good flat surface. Whilst machining we encounter several small hard spots in the weld - which is probably to be expected given the amount of cast iron welding that had to be done to fill the cracks and build up the seats. To help the tool deal with the tough bits I use a stainless steel grade of tip, and regrind it to a radius of about 0.080" - this gives the cutting edge extra strength and helps with wear resistance. 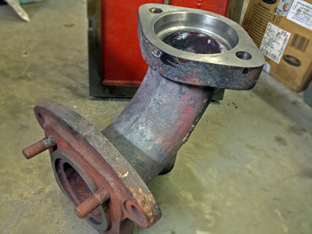 The bore is machined to a nominal size and tapered to match the 10 degrees of the regulator valve spigot, put a radius in the corners and then skim the faces to ensure squareness. The whole unit is then deburred and turned around on the machine. 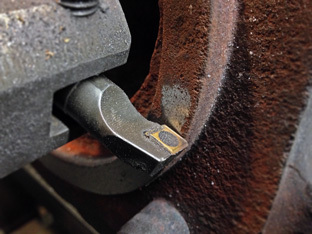 We now need to re-face the seal spigot that mates up to the steam outlet. I carefully clock the part to ensure that the faces are at exactly right angles to each other (there's not much movement in the mating pipes so this needs to be right). The spigot is machined to a good flat surface for the gasket and the whole lot given a good clean to remove any traces of swarf. We produced a short movie of this part being machined which will be uploaded to the website soon! Component was featured on the website home page (May 2013).